It's no secret that we care about horse properties and the lifestyle. Sell your horse property, horse stud, equestrian facility or acreage on Australia’s number 1 Horse Property website, privately or via an Agent. Horseproperty.com.au is the first and most specialised horse property website in Australia and is dedicated to bringing horse property vendors and buyers together. Our users love the easy searching of properties instead of searching through countless properties that don't match their desired needs. The home page carousel shows all Featured properties, this allows for more exposure. When users load horseproperty.com.au, the carousel is one of the first sections they will see. Users can quickly look through the current feature properties without even leaving the home page. The home page Premium carousel shows all Premium properties. Users can quickly look through the current Premium properties without even leaving the home page. The carousel shows two current premium properties at one time automatically scrolling. This allows more focus on two premium properties at one time. We take a portion of your listing fee and create a social Boost that market’s your property across specific digital channels and platforms for 10 days. You benefit from organic marketing along with PPC (pay per click) marketing. Our marketing team nurture these channels growing them with the most prominent potential buyers. Accurate yet sophisticated targeting is used to reach valuable buyers. These channels and platforms allow for a greater reach and exposure at a local, national and global level, which are highly suited for advertising a property in today’s market. Advertising online just got easier. There is no work involved for you! We are the only real estate portal in Australia that includes this great add-on. We take a portion of your listing fee and create a Hybrid Boost that market’s your property across specific digital channels and platforms for 15 days. You benefit from organic marketing along with PPC (pay per click) marketing. Our marketing team nurture these channels growing them with the most prominent potential buyers. Accurate yet sophisticated targeting is used to reach valuable buyers. If there are land features you would like to add but there is no option to select from, you can add more land features and information in the text box provided. If there are specific horse facilities you would like to add but there is no option, you can add more specific horse facilities and information in the text box provided. This section allows you to add livestock information regarding the property. Horseproperty.com.au is currently connected to MyDesktop, Rex, Prolist, Agentbox and Core Web. To easily be connected and make life simple just contact horseproperty.com.au and we will take care of the set up arrangements! We are also looking to connect to all other uploading software's, so just let us know which one you use and we will even inquire for you to get you connected. We offer email and phone support for all users, there is NO extra cost. You have the option to email us from our contact page. Alternatively you can call horseproperty.com.au. It doesn’t matter the issue, just give horseproeprty.com.au a friendly call. Call support will have a quicker response and turnaround time. We also offer friendly advice so don't think twice to ask our friendly qualified staff. As a Featured listing, your property will appear above all Standard listings, allowing for more exposure. As a Premium listing, your property will appear above all Featured and Standard listings, allowing for more exposure. The listing will remain a Featured or Premium listing for 60 days (rotating every 30 days) after which the listing will change to a Standard listing and stay on our real estate portal until sold! To easily be connected and make life simple just contact horse property.com.au and we will take care of the set up arrangements! We are also looking to connect to all other uploading software's, so just let us know which one you use and we will even inquire for you to get you connected. 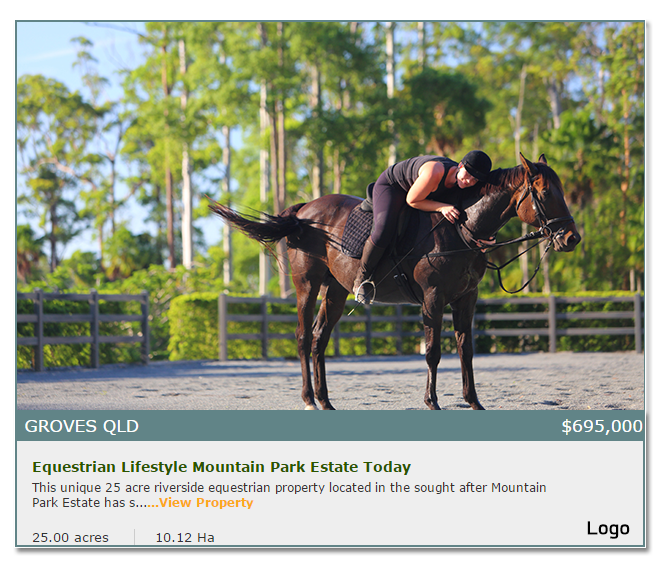 Horseproperty.com.au gives agents and private sellers the opportunity to advertise their beautiful property to relevant buyers who can easily search for their dream lifestyle property. Mobile phones play a massive part online. Today the majority of searches are done via mobile or tablet. We make sure that your ad is well presented on desktop, but also mobile and tablet. List your horse property complete with description, up to 20 high resolution photos, video link and the opportunity to detail the horse specific features of the property such as stables, arena, paddocks or round yard. Agents that list with horse property will get their own Agent profile with description, contact details, social profile and interactive Google map. It's never been easier to list your property online.